Humans are affecting nature in different ways and threatening the crucial diversity of plants and animals. To know how to best to tackle the problem, we need more knowledge about what species can be found at different locations at different times of the year. Unfortunately, expert knowledge is often required to distinguish different species, and there are not enough experts to carry out the task themselves. This is the challenge that Miroslav Valan, a researcher at the Swedish Museum of Natural History and Savantic, an artificial intelligence company, plans to tackle in the Ladybird Experiment. ”An app that automatically identifies different species would make the expert’s work a lot easier, as well as enable ordinary people to help investigate ways to protect our planet’s plants and animals,” said Miroslav Valan. As part of the Ladybird experiment, Miroslav is requesting the help of Swedish school pupils and members of the public to develop such a mobile app. The aim is to create an app that can recognise over 60 species of ladybird found in Sweden. To train the app, Miroslav now needs lots of photos of Swedish ladybirds. 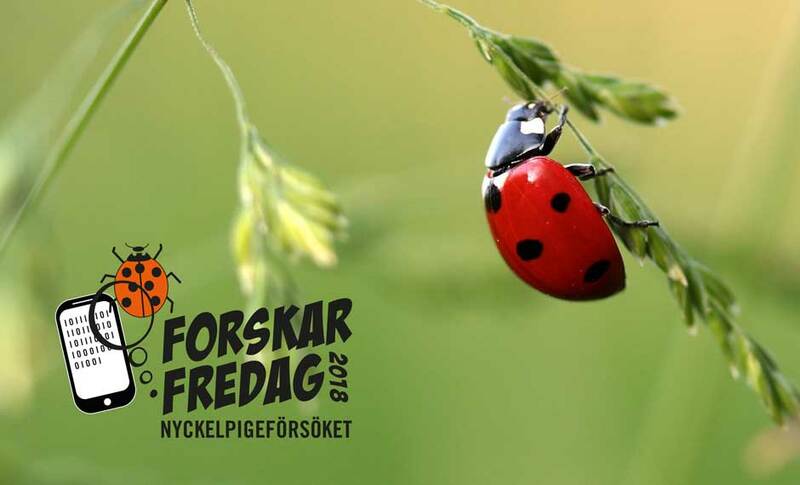 ”We hope that both the public and pupils of all ages across the whole of Sweden will get involved in photographing ladybirds. Participants will also get to learn about how research is conducted, about biodiversity, and how artificial intelligence can help solve societal challenges,” said Martin Bergman, Project Manager for the Ladybird Experiment at VA (Public & Science). All that is required to participate is a smartphone or tablet, a simple plastic lens for taking the pictures, as well as a specially developed app that will be available to download from the Swedish Researchers’ Night website at the beginning of June. Photos will be taken during the late summer and early autumn. The fully-trained app will be ready in spring 2019. The Ladybug Experiment is part of the Swedish Researchers’ Night activities, a science festival that has been held annually since 2006 in cities throughout Sweden on the last Friday in September. ”The aim of Researchers’ Night is to show how exciting research can be, its relevance to our daily lives, and that researchers are ordinary people with extraordinary jobs,” said Lena Söderström, Project Manager of Swedish Researchers’ Night. Known as ForskarFredag in Sweden, this year’s Researchers’ Night activities will take place on 28-29 September in Blekinge, Borås, Dalarna, Eksjö, Falköping, Gotland, Gothenburg, Halland, Jönköping, Lidköping, Linköping, Luleå, Lund, Piteå, Skellefteå, Skövde, Stenstorp, Stenungsund, Stockholm, Sundsvall, Södertälje, Umeå, Uppsala, Västerås, Öland, Örnsköldsvik and Östersund. For more information, visit https://forskarfredag.se/researchers-night/ or contact Martin Bergman or Lena Söderström. ForskarFredag is part of European Researchers’ Night and is organised by Swedish universities, science centres, museums, research centres, municipalities and regions. The events are coordinated nationally by VA (Public & Science) with the support of national partners and the European Commission. The Ladybird Experiment is being conducted with funding from Formas research council and the European Commission under Horizon 2020 in the framework of the Marie Sklodowska Curie actions, GA No 642241.